With only a few ingredients, this Spinach with Feta and Pine Nuts comes together in no time. 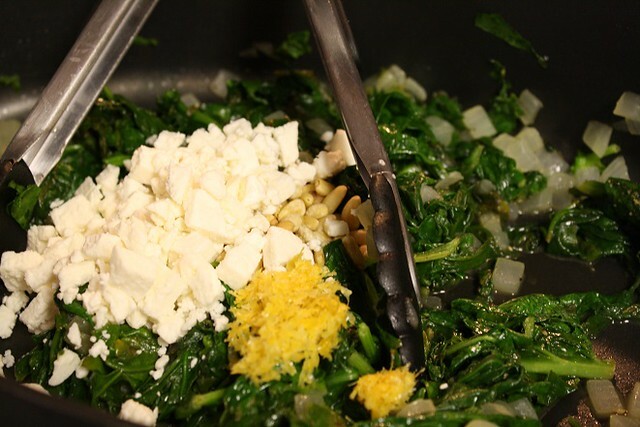 Here’s what you’ll need: Salt & Pepper, Crumbled (or Diced) Feta cheese, Pine Nuts, 1 Lemon, about 1 pound of Spinach (or baby spinach), 1 1/2 cups of diced Yellow Onion (this was about 1 medium yellow onion), and Olive Oil. 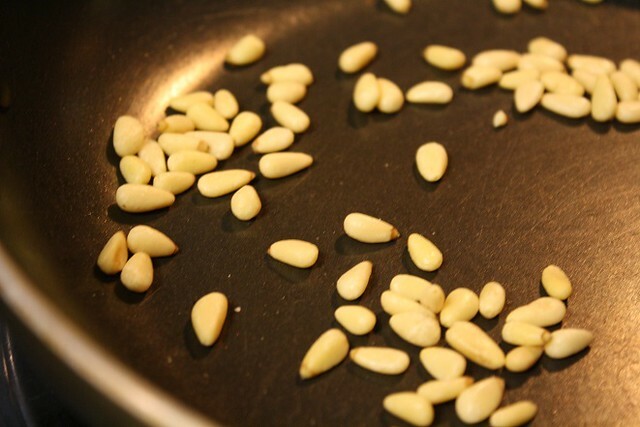 Start off by toasting the pine nuts. Heat a small skillet over medium high heat. 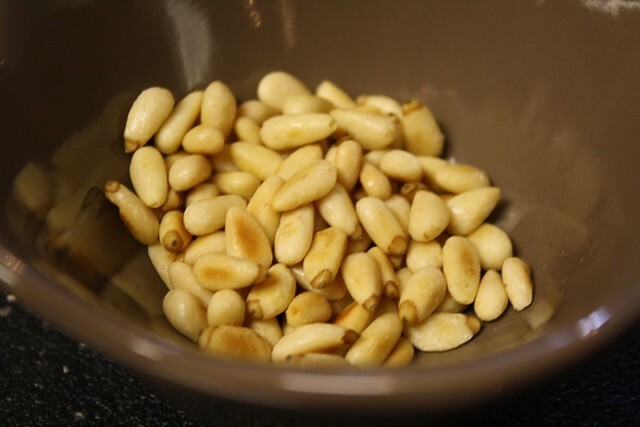 Once the pan is hot, add the nuts and stir constantly until the pine nuts begin to brown a little. You can see how the nuts brown here if you aren’t sure what to look for. Grab a large saute pan and heat it over medium heat. 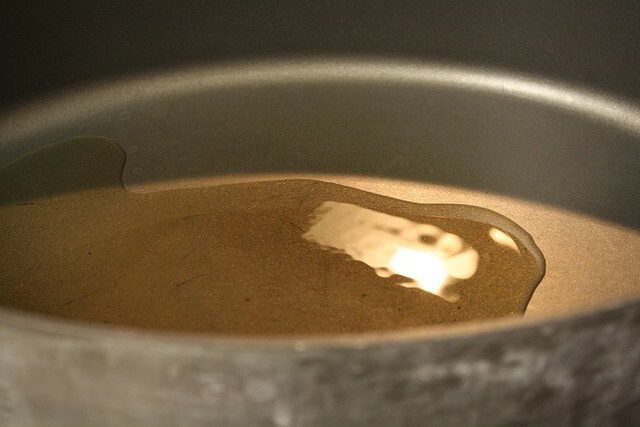 Add 2 1/2 tablespoons of good quality olive oil to the pan. Once the oil is hot, add in the onions. 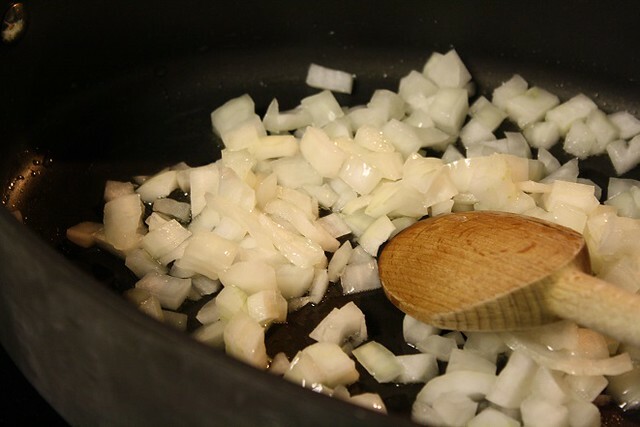 Stir pretty regularly for 8-10 minutes or until the onions are tender but not brown. While the onions cook, zest 1 lemon. I love using the Microplane grater upside down so it’ll collect the zest. It really makes it so much less messy and easier to handle. 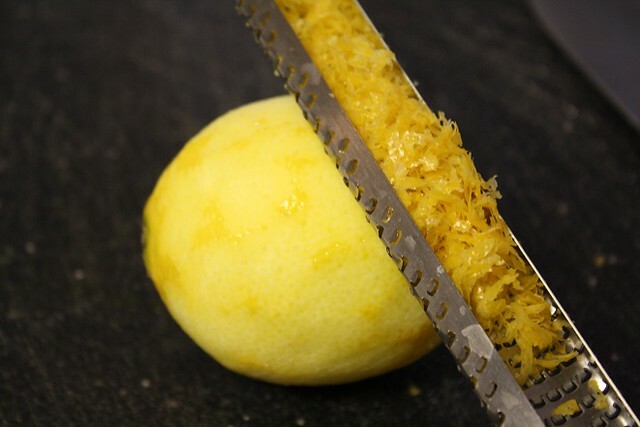 Once the lemon is zested, cut the lemon in half and juice both halves. 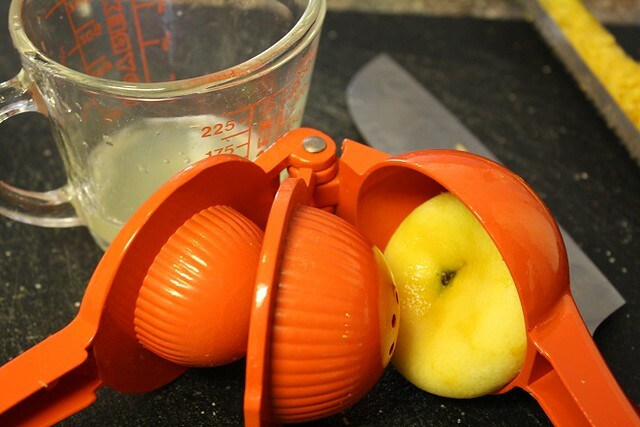 Set the zest and juice aside until you need them. After about 8 minutes, the onions were ready to go, so add 1 1/2 tablespoons of the lemon juice to the pan. Next add handfuls of spinach at a time. If it’s baby spinach just add in the whole leaves. I used regular spinach, so I just tore the leaves with my hands as I added them. 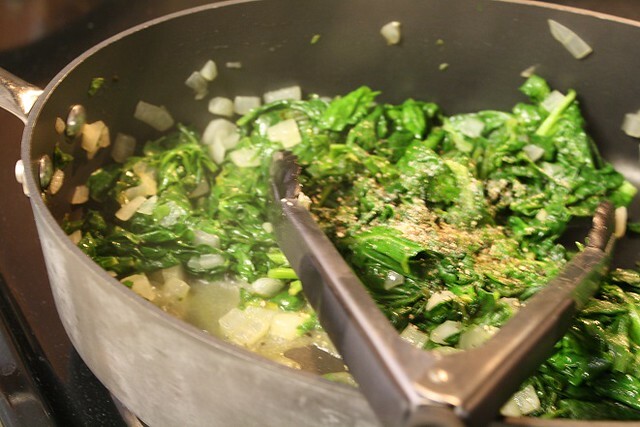 Then use tongs to combine the spinach and onions until the spinach wilts. This takes about 1-2 minutes. Then add in about 1/2 teaspoon of kosher salt and freshly ground pepper and combine. Finally remove the pan from the heat. 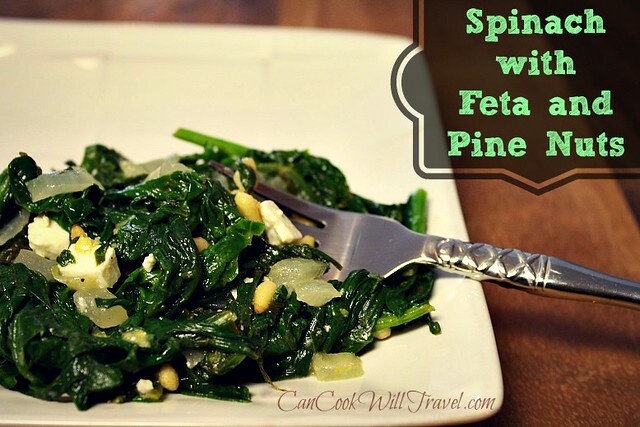 Add 1/2 cup of feta cheese, 1 1/2 tablespoons of toasted pine nuts, and 1 teaspoon of lemon zest. 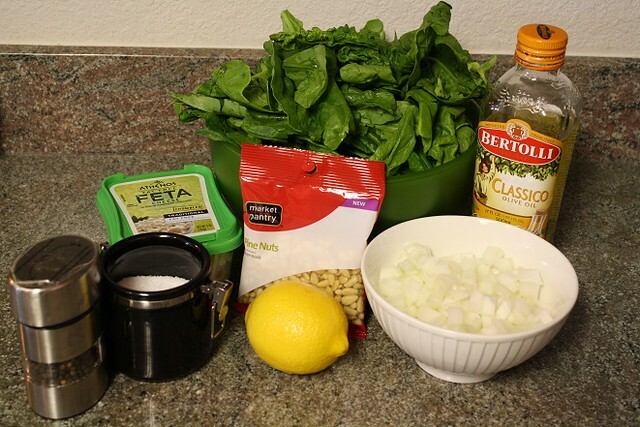 Combine all of the ingredients with the spinach and serve it when it’s hot. This makes a great side dish to chicken, fish or any meal really. It’s delicious! Happy wilting! 1. Once all of the veggies have been prepped, grab a large saute pan and add the oil. Heat it over medium heat and add the chopped onion to the oil. Stir regularly for about 8-10 minutes. You’re looking for the onions to be tender without browning. 2. While the onion cooks, zest a lemon and reserve the zest. Then juice the lemon. 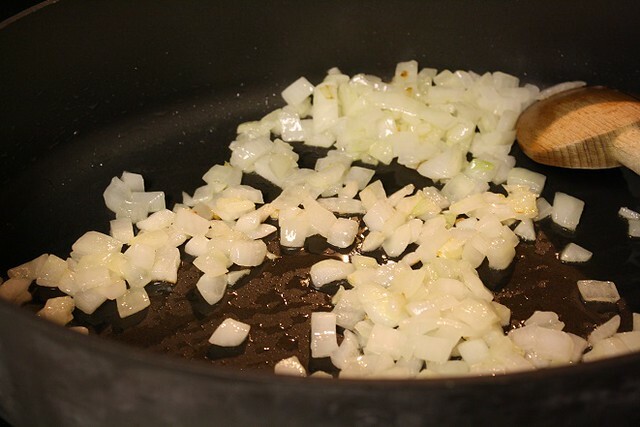 Once the onions are cooked, add 1 1/2 tablespoons of lemon juice to the onions. 3. Time for the spinach. Grab the spinach and add by the handfuls. You’ll need to stir as you’re adding the spinach. 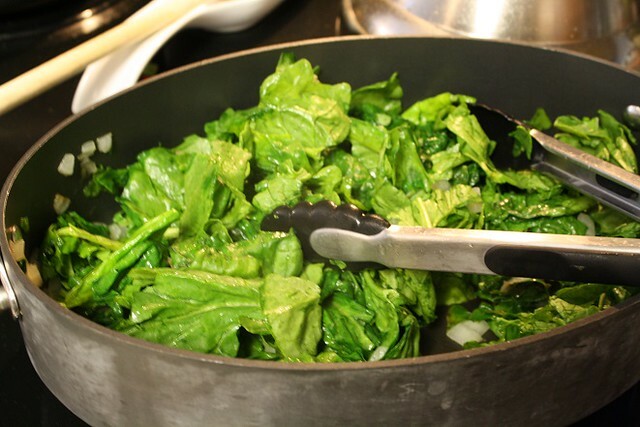 Once it’s all in the pan, stir it for about 1-2 minutes until the spinach has wilted. Add salt and pepper to taste to the the spinach and combine. Aim for about 1/2 teaspoon of each. 4. Finally remove the pan from the heat. Add 1 teaspoon of the lemon zest along with 1 1/2 tablespoons of toasted pine nuts, and 1/2 cup of feta. Lightly toss the spinach and then serve while it’s still hot. Enjoy!